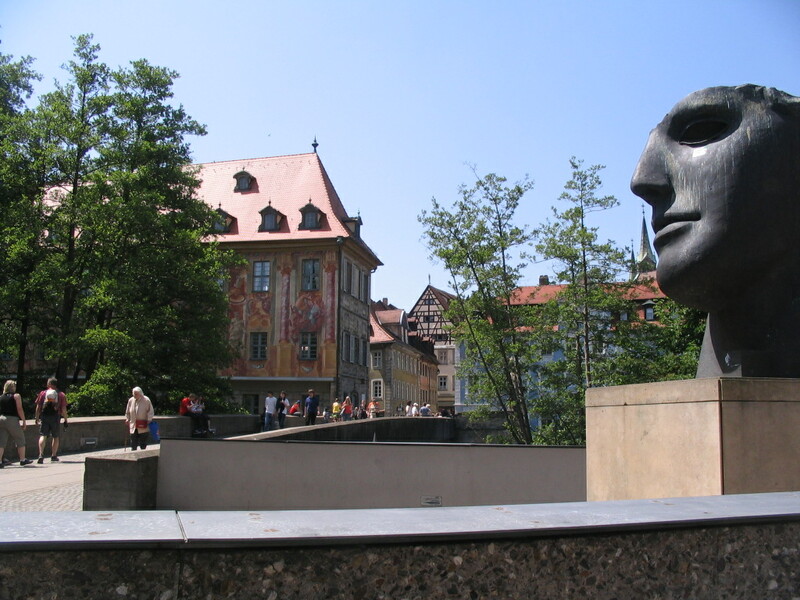 The next day was my one full day in Bamberg, so I spent most of it walking all over town and seeing everything I could. 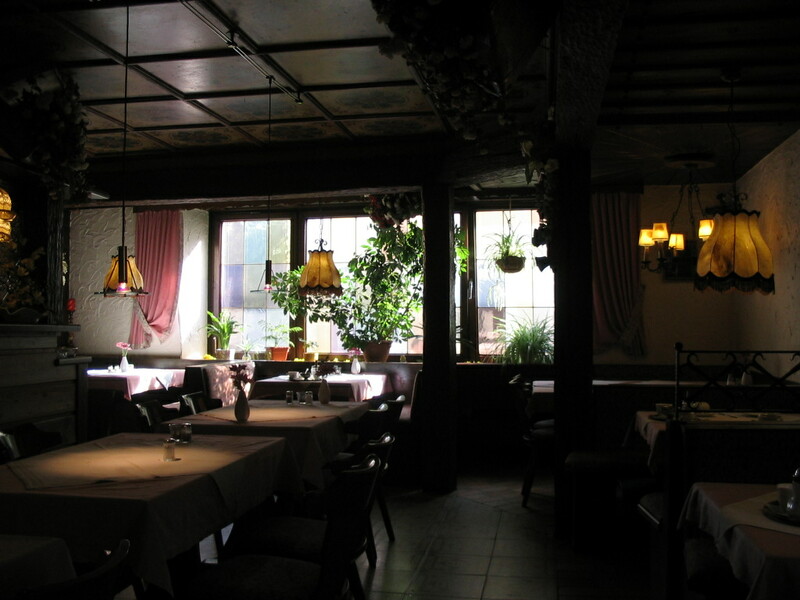 The softly lit dining room of Die Alte Post as I breakfasted. 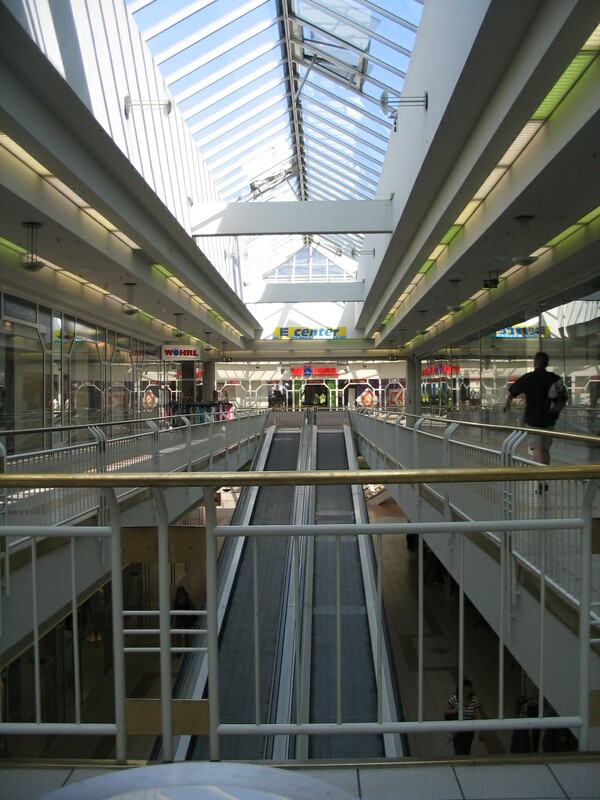 I headed over toward the station and went inside the E-Center shopping center nearby, and it contained the second rampscalator I've seen (though now I'm having doubts — does Kamppi have a rampscalator?). Some lovely bursts of spring. I had essentially moved forward half a season in the span of a week, between Helsinki and here. 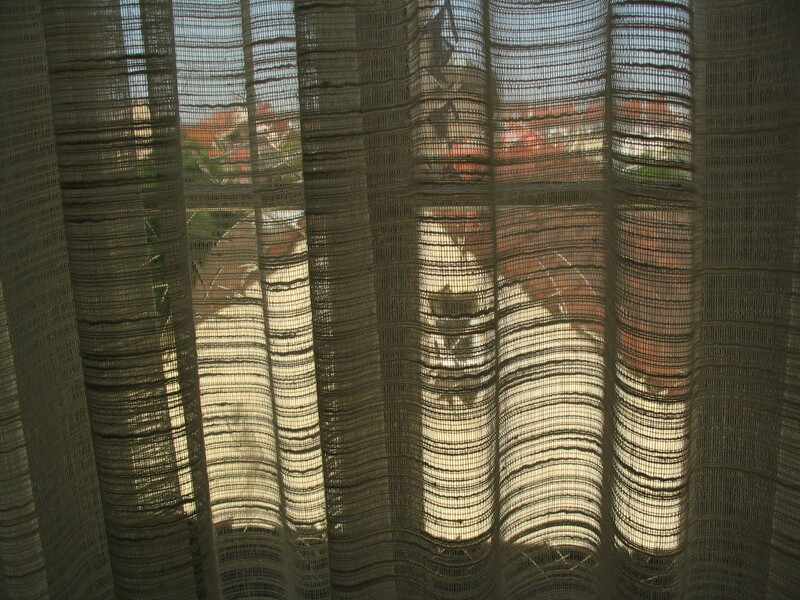 A stop back at the hotel and another look through the hallway window curtains, doubly gauzy via the curtains and the glass texture. 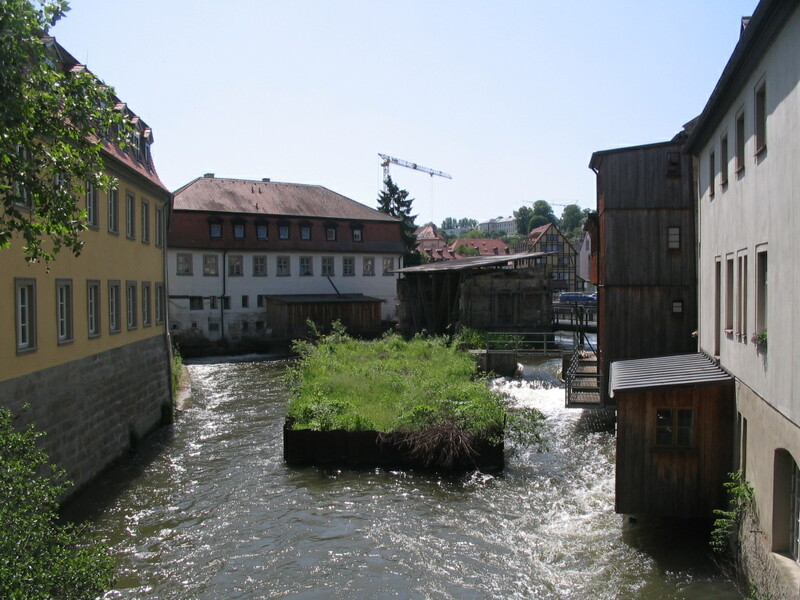 Then I headed out across the canal to the Inselstadt. Here, quite the selection of terrace levels on the right bank. 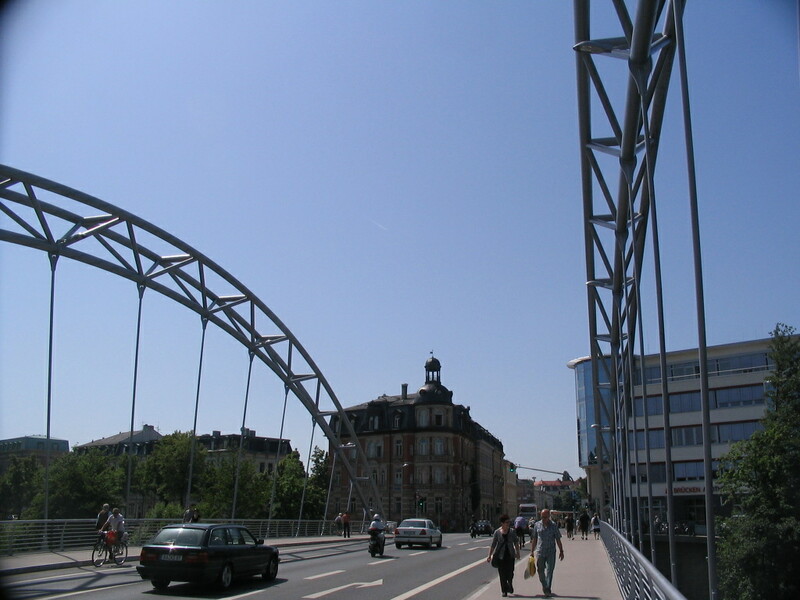 A daytime look at the Luitpoldbrücke. 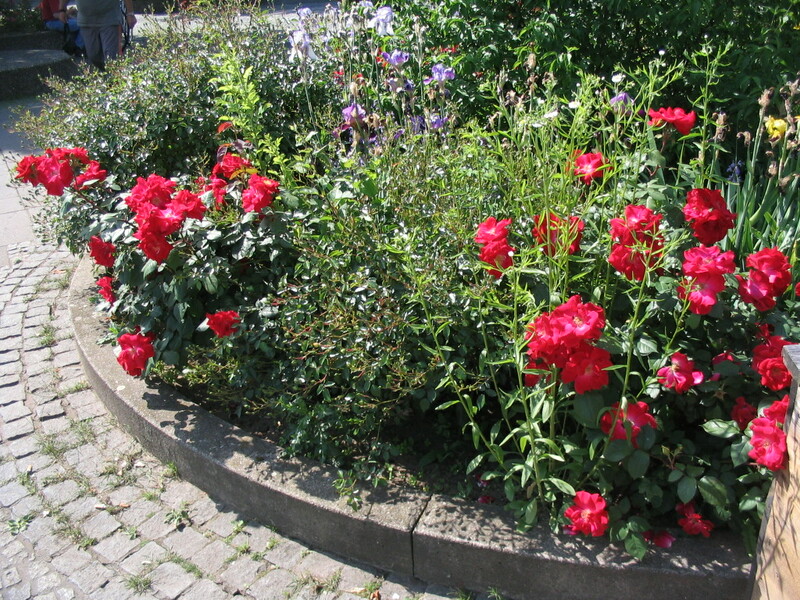 A sufficiency of roses and other blooms. Oh thank goodness. 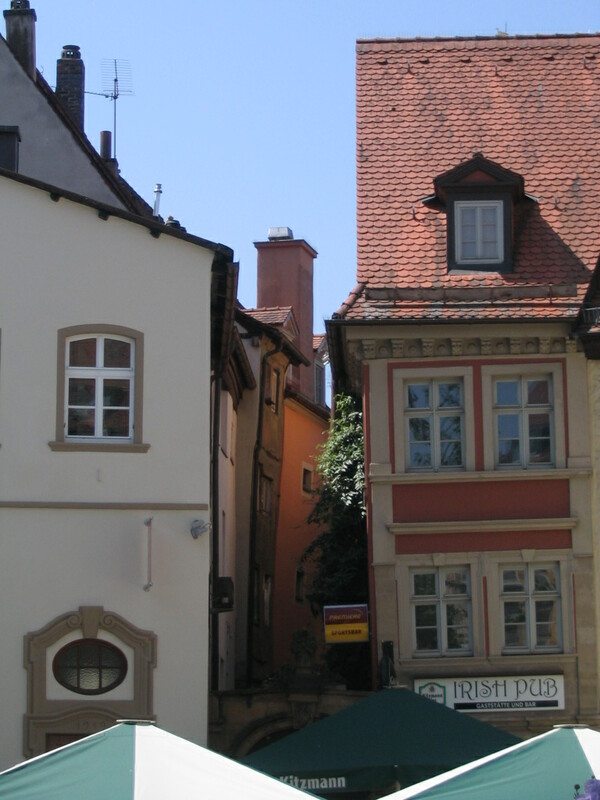 I was just languishing here thinking there was no Irish pub to be found. Whoa now here is a totally sweet fountain! I've never come across anything similar elsewhere. 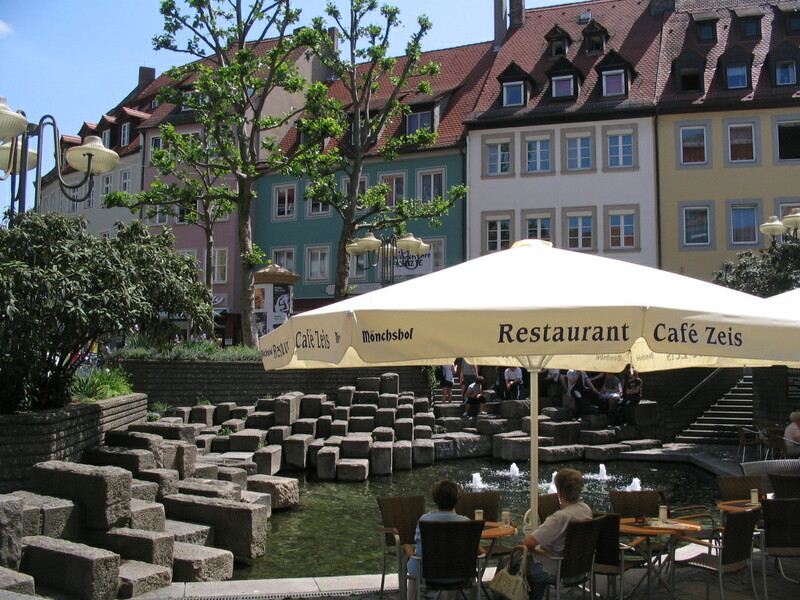 This is in a triangular space denoted "Obstmarkt" (Fruit Market) on the maps. Wow, it must be a challenge to set up the fruit stalls. 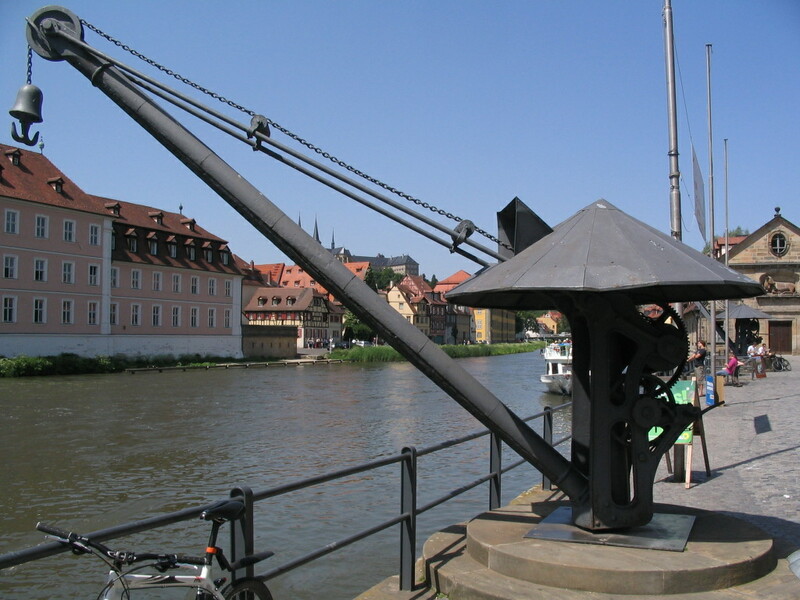 Finally we reach the left arm of the Regnitz. 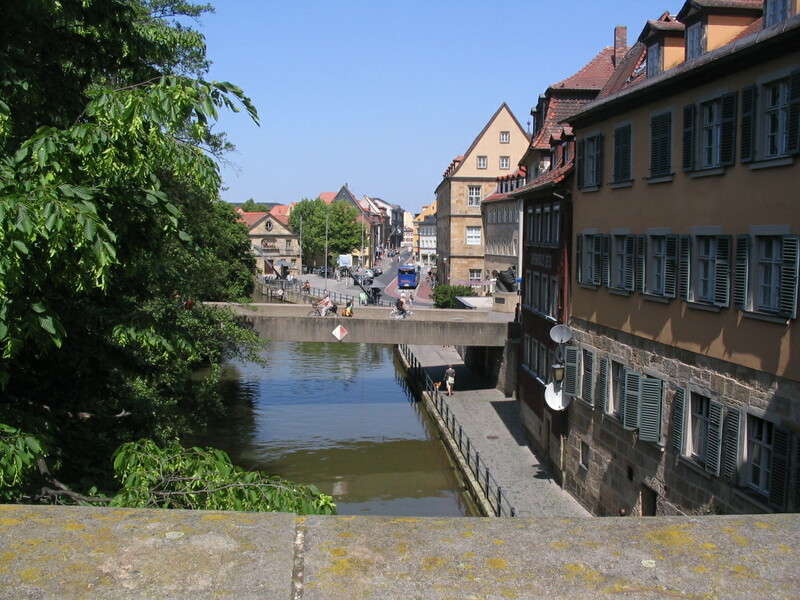 This photo was taken from the Untere Brücke (Lower Bridge) and the pictured bridge is the Obere Brücke (guess). 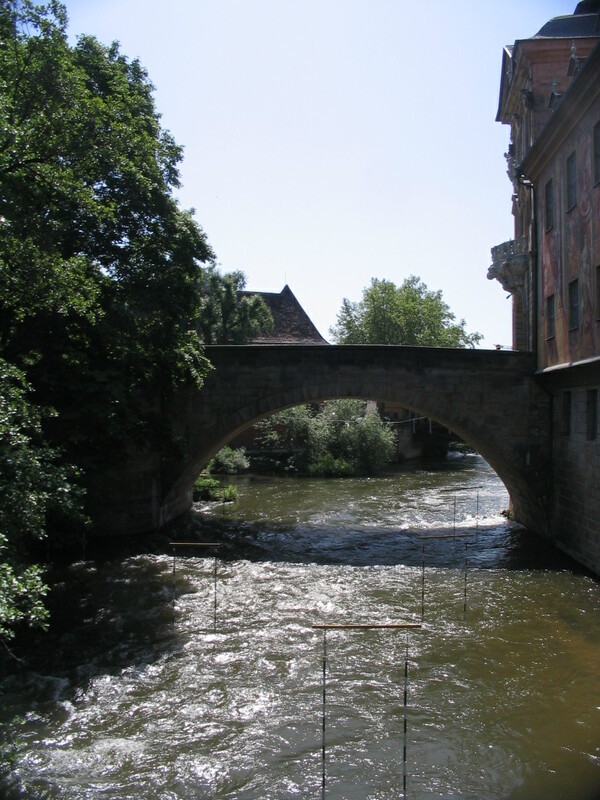 The names are doubly apt as the Untere Brücke is both downstream from and lower in elevation than the Obere Brücke. 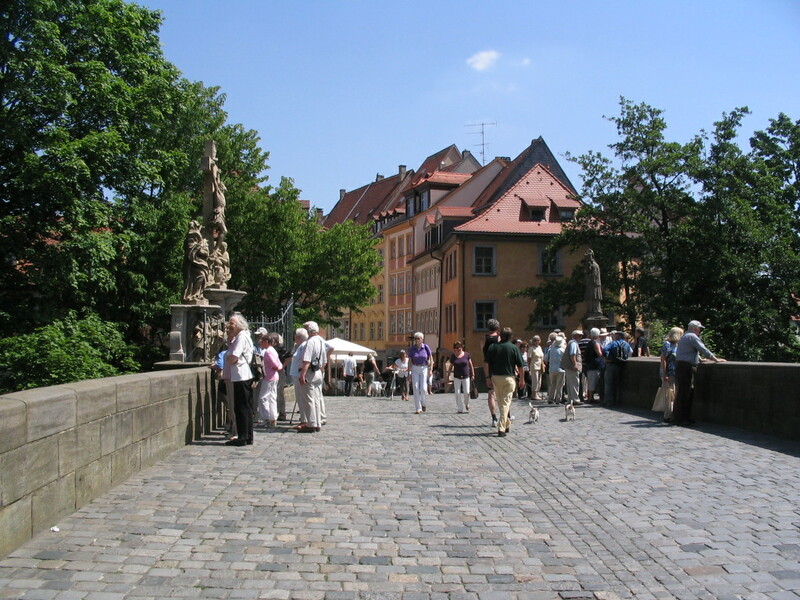 The two bridges cross each end of the Altes Rathaus (Old Town Hall), pictured here, which sits on a little island in the Regnitz. 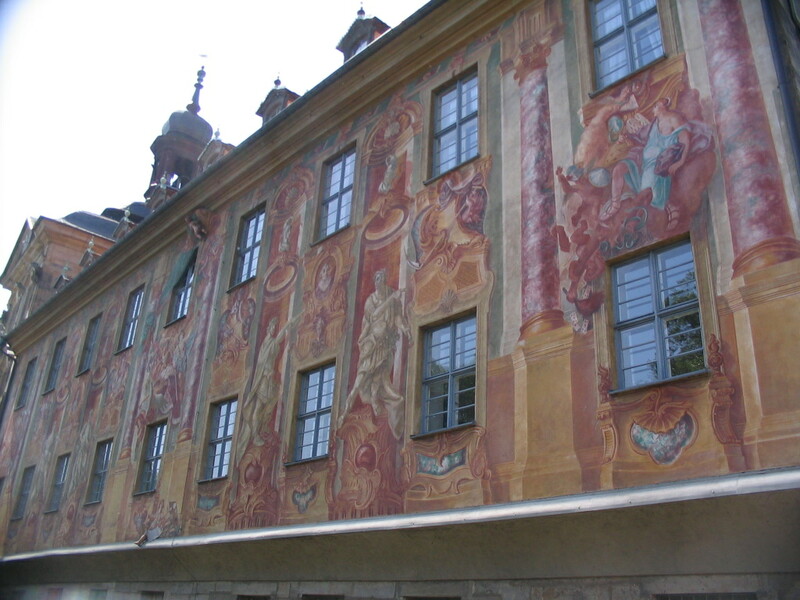 It appears to date back to the 14th century but was rebuilt in the mid-18th century. 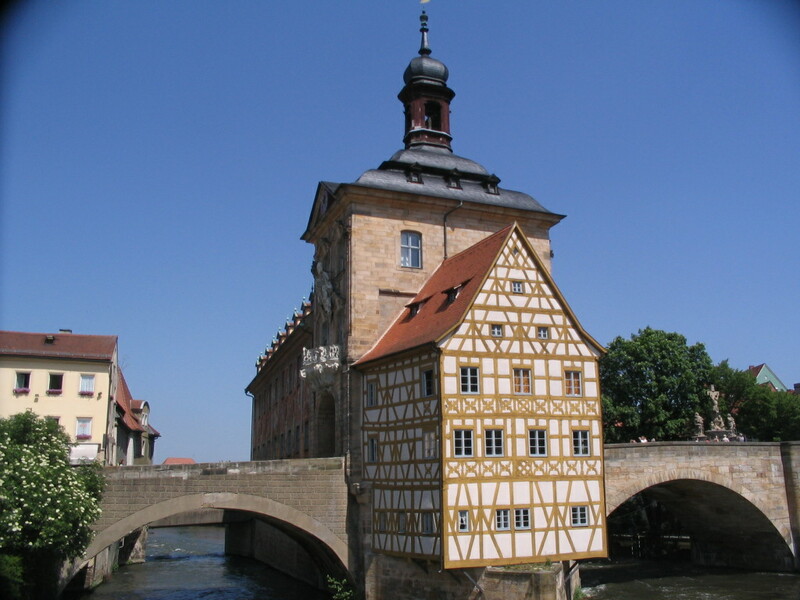 I think it makes sense to consider the Altes Rathaus the heart of Bamberg, as the densest, oldest parts of the city are roughly centered on it, bisected by the river. 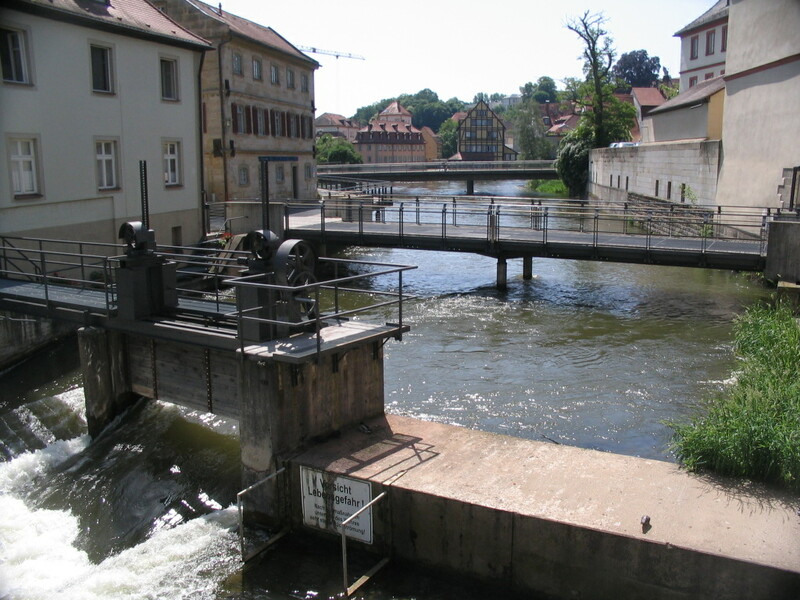 Upstream bridges, from another bridge, the Geyerswörthbrücke, just upstream from the Obere Brücke. 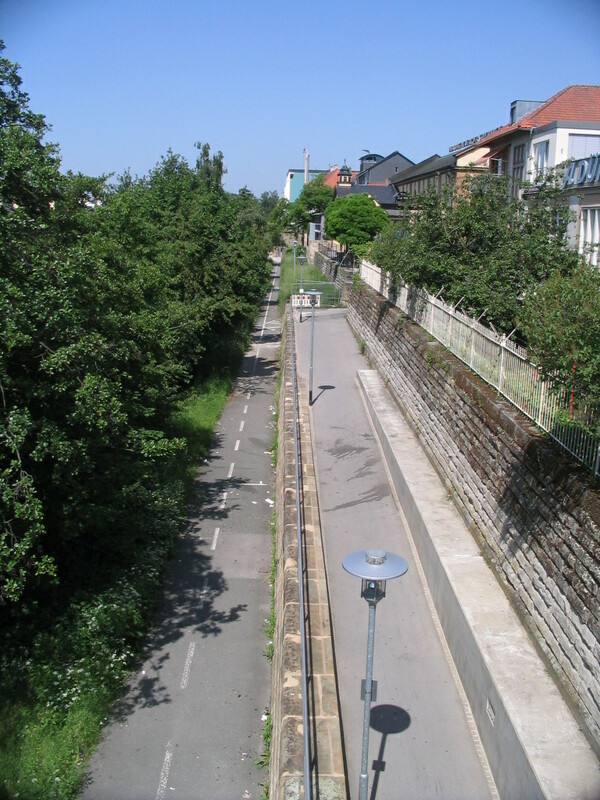 The maps indicate six bridges in the span of 300m here. 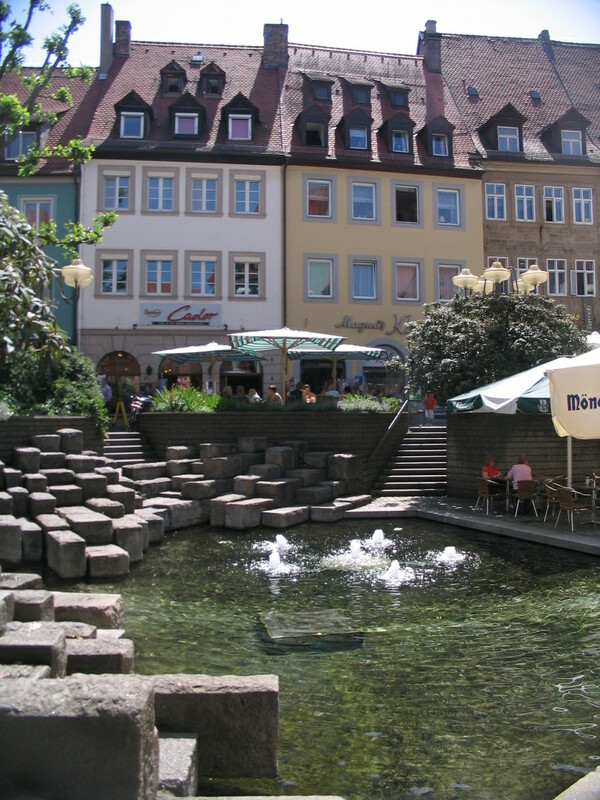 An upstream view of the Altes Rathaus from the same bridge. The big mid-river planting box is a nice touch. 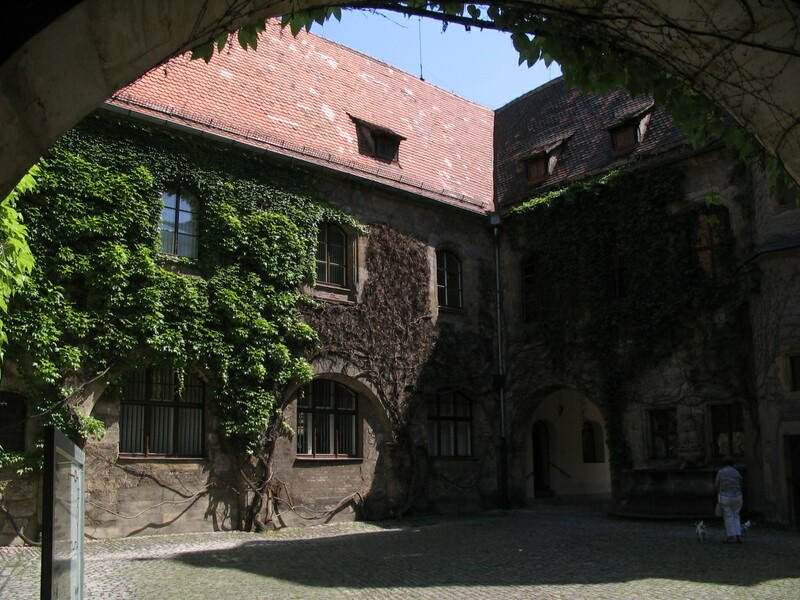 This pleasant arch-and-courtyard appears to be at the Schloss Geyerswörth, also on a (much larger) midstream island; its construction and rebuilding happened at similar times as the Altes Rathaus, so I gather. 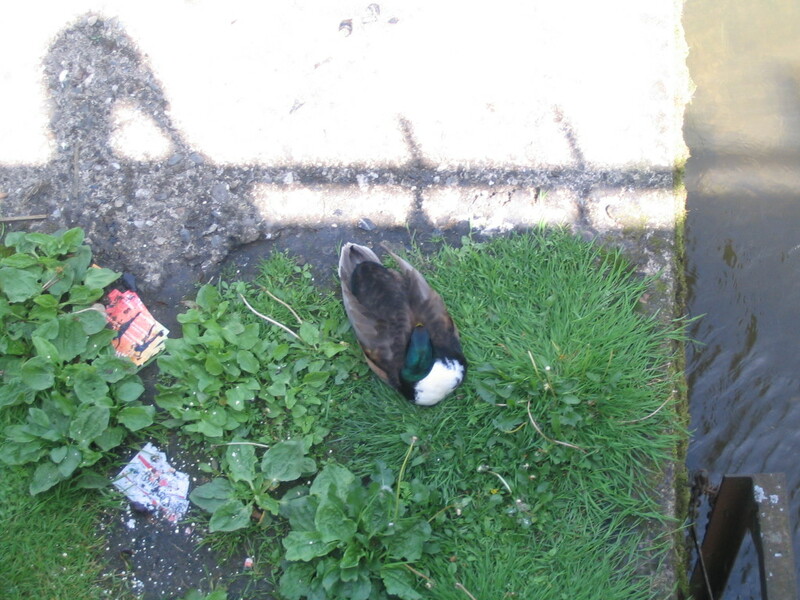 Directly below the Geyerswörthbrücke: a napping duck. 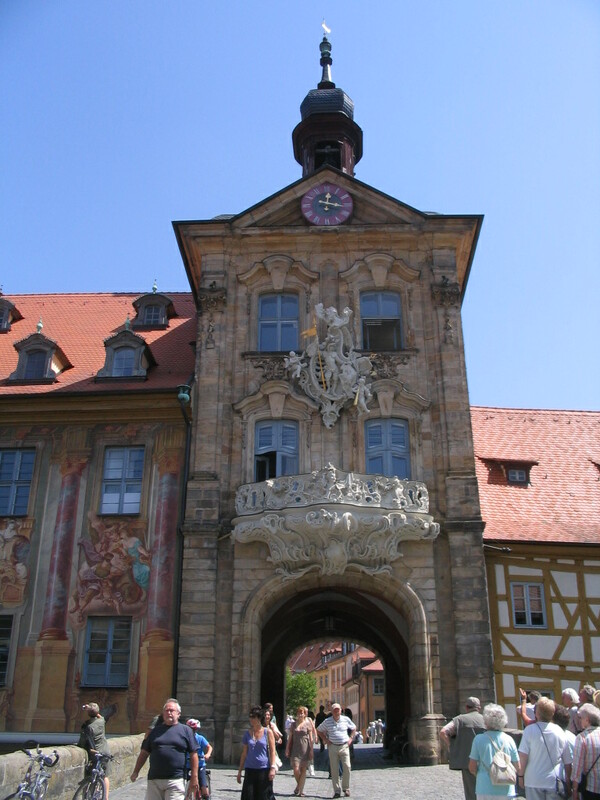 The maw of the Rathaus, with the bridge passing straight through. Very nice topological complexity here. 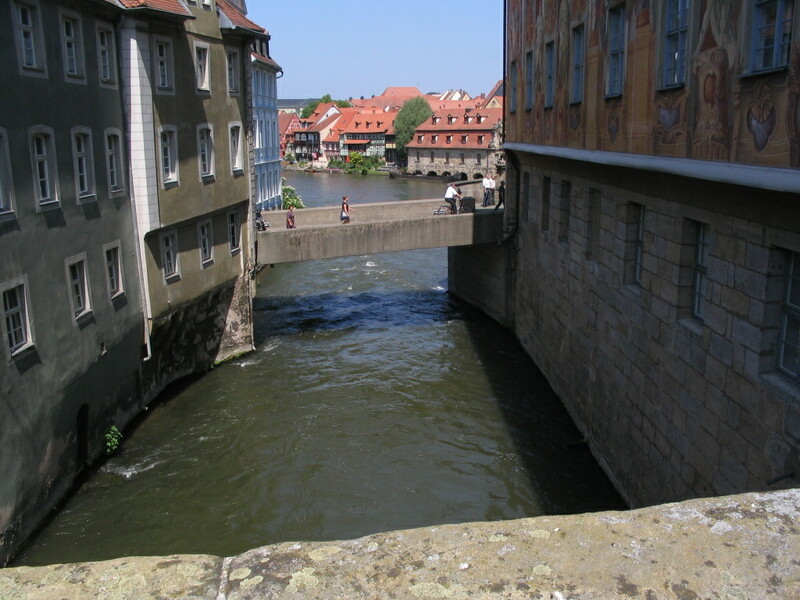 A look downstream back to the Untere Brücke. Jeeeez, I'm like a third of the age of everyone else here. Except those doggies. 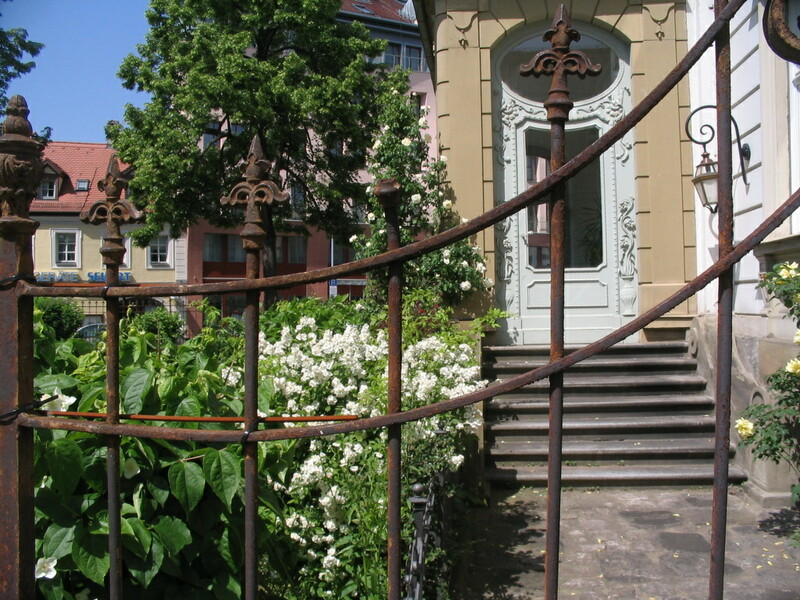 The other half of the Untere Brücke. There! There are some other youths. 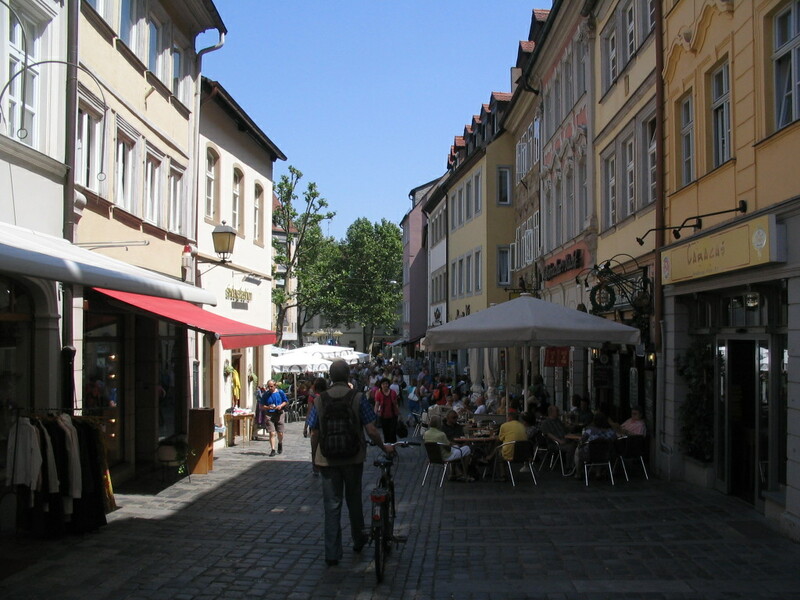 A bustling lunchtime scene back at the Obstmarkt. This is such a pleasingly sculptural thing and yet it (I assume) is actually a functional assembly, which is even better. The hook-bell at the end is a curious detail.